This app is by far one of the most important and useful apps that is related to my work. I don’t know what I’d do without Ezccs. Everyone has it, get it and make your life much easier. Really sorry I retired as a 777 captain after 5 years of using this app and only access non CCS items now. My FA wife still uses it but my finger was so trained to push EZCCS that it’s withering away at the bone. Great job, Scott, and thanks for simplifying our lives for all these years. Please fix the jump seat listing part of this app. I could not list today on off line SWA. The format does not work with I phone XR.The older way was way better. Thanks. This App is the Best there is! The day I started using this app my whole work life got so much better. It literally made me giddy happy all day! This app is not just useful, extremely intuitive and smart, but the fact that it exists, gives me hope that there are truly amazing innovators out there. We are fortunate that this one is among us. Yes - that’s how good and beneficial this app is! The same goes for his other app EzBid. Simply amazing, and can’t do without these in my life. It’s not that it thinks for you, it’s just a step ahead of all your flight-app needs. All of them! I would pay $250+ for this app. I am not exaggeration or joking either! The auto login is worth the cost of the app, but there is so much more to love about it. You can customize the layout to get the functions you use easily accessible. Trip trading is a breeze with the unique trip view. Tracking reserve status and aggressive pickup is a snap, too. The logbook export is great for updating your chosen app. 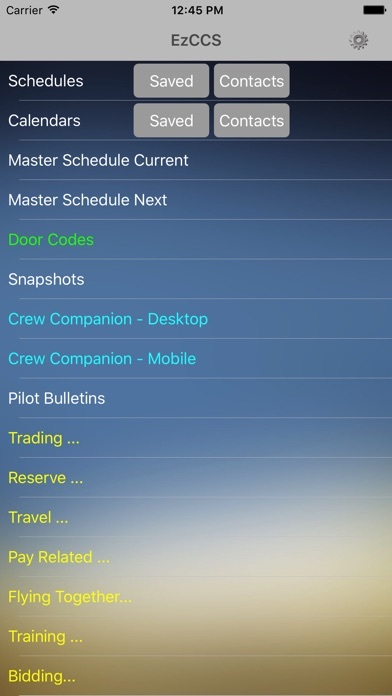 Viewing pairing info, door codes, crew info... all a couple taps away. I’m sure there is even more functionality that I don’t use, but for everything I do, this app makes easy and readily accessible. Thank you for all you do and working so hard to keep this up to date with the new ccs. You make it so easy to use my work functions! Who wouldn't subscribe to this app? Even $10 is a bargain. I've made thousands just by more easily picking up trips with this app. And commuting is way easier also. Love this app, but will it be compatible for the flight attendants come October? Don’t want to renew if it’s not going to work for us anymore!